Regular home maintenance will keep your house functioning and looking great for years to come. Since your home is likely the most expensive thing you own, this should be a top priority. Fortunately, there are several regular maintenance tasks and repairs you can take care of on your own. Maintaining your HVAC system will help it run efficiently, lowering your energy bills, increasing the system’s lifespan, and reducing your need for expensive repairs. Though there’s not much you can do yourself if the thing goes belly-up, you can at least keep on top of basic maintenance tasks. Changing your HVAC filter every month will reduce drag on the system and keep the air in your home feeling fresh. Make sure you choose the right filter size to fit your system. In some cases, people need to buy custom-fit filters. You can also keep your HVAC system running smoothly by regularly removing debris from your outdoor air-conditioning unit and keeping it level. There’s nothing worse than a broken air conditioner on a hot summer day. If yours suddenly stops working, replacing a dirty filter can often get it kicking again. Otherwise, find a local professional to get your unit fixed. HVAC systems with quality filters do a good job at removing indoor air pollutants, but lingering moisture in the home can still encourage bacteria and mold growth. Check for leaks around your toilets and sinks. Clean out your gutters on a regular basis and repair any breaks. You may be able to use a hose to flush debris out of your drain pipes. Also, direct moisture away from your home by sloping the ground away from your house’s foundation. If your basement tends to get damp, rip up the carpet and replace it with a simple vinyl floor. You can also repair settlement cracks in your foundation with patching cement to keep moisture at bay. Waterproofing paint can be added to basement walls to help seal out moisture. Though you may need to hire a professional for HVAC repairs, difficult plumbing work, and large electrical jobs, you’ll be able to make some functional fixes yourself. For example, you can replace a faulty light switch by shutting off the power and following this detailed guide from Hometips. If your garbage disposal gets jammed, you can clear it by inserting an Allen wrench into a socket on the bottom of the unit. This allows you to rotate the spinner manually and free the interfering object. Stuck windows and sliding doors can also be a huge pain. Loosen these by rubbing soap or candle wax along the metal tracks of the window. 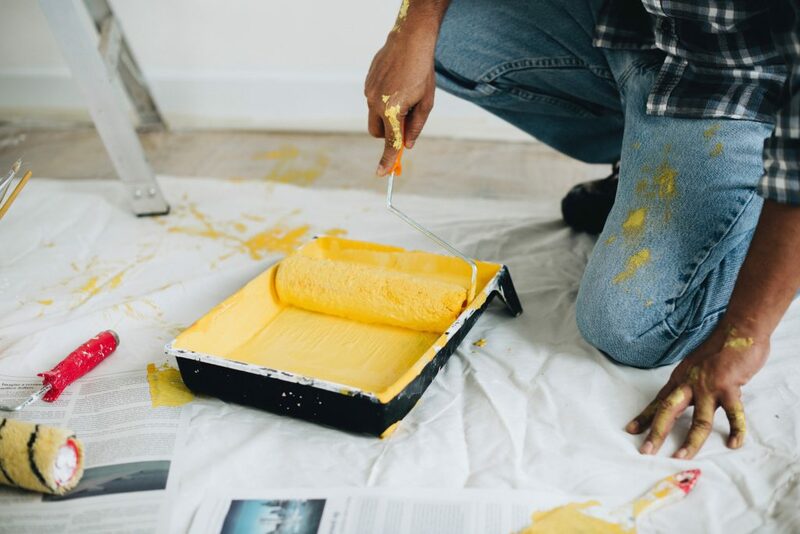 Fixing cosmetic damage is one of the most rewarding home repairs you can tackle, you will immediately see how your efforts made your home a little more beautiful. Cracked molding, holes in drywall, and broken drawer handles are common cosmetic problems. Craving Some Creativity recommends repairing cracked molding by stripping the old caulking from the seams and applying fresh caulk. Fixing holes in drywall can be a little more complicated and requires more supplies, but it’s fairly easy to do on your own. You will need to find a piece of drywall that’s the same thickness as your drywall and prep the hole by cutting out a square around the damaged area. Check out This Old House for a thorough drywall patching guide. You can also keep your flooring in good shape by tackling stains. For example, if you own a pet, you’re probably aware of the possibility that your furry friend could have an accident on the carpet. Removing pet stains can easily be done without having to call in a cleaning service. The trick is to create a solution of one part white vinegar and one part water and apply it while the affected area is still wet. Vinegar neutralizes odors without damaging the carpet. Of course, when a home repair is out of your league, don’t hesitate to hire professional help. But doing smaller repairs and routine maintenance on your own is extremely rewarding and a great way to save money. Why pay a professional when you can do the job yourself and learn a little something in the process?